As this is the first time I even hold a airbrush please don't be too disappointed if I'm not using the right colours or markings! Manage to pick about 8 so I have for most of the builds to come .. even if a some of them don't seem to be the same size?! The right one must be a dwarf or something .. Welcome to the Group Build! Looks like you're off to a good start already! Just enjoy the process and don't stress about the results. 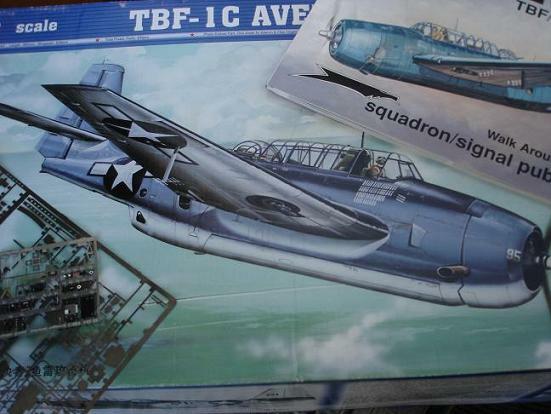 BTW is it just me or are the Revell models smaller than the trumpeter ones? 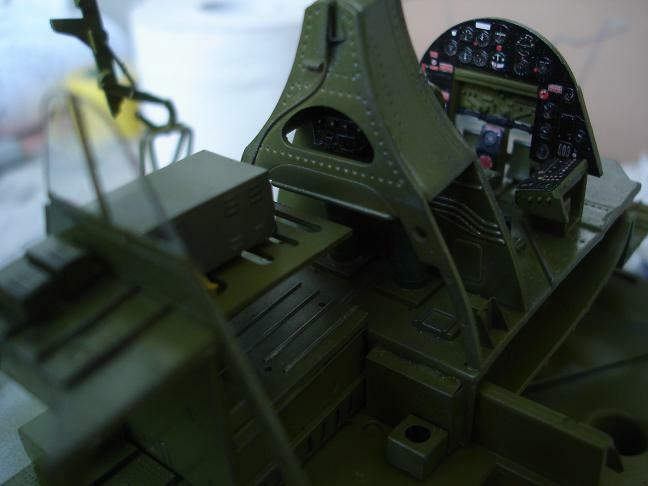 Can't fit the masterdetail pilot in a revell chair but it seems to be a perfect match in the trumpeter!? The airbrush is really giving me pain - I don't seem to be able to do any details as the spread is too wide and if I turn it down it stops putting out any paint (I wish I could show you what I mean but the kids took the camera so I can't take any picture until they are back). I tried to thin the paint with thinner to a 40/60 but then the colour is too watery and doesn't cover at all so I'm back to 70/30 as it covers better. Also working with acrylic paints is a new experience, it seems you need a sealer or something as if you try and paint over something (even if it's been drying for days) it mixes with the old colour in a way specially if you hand brush it. So I've now ordered some flat and glossy clear which hopefully will solve that problem. 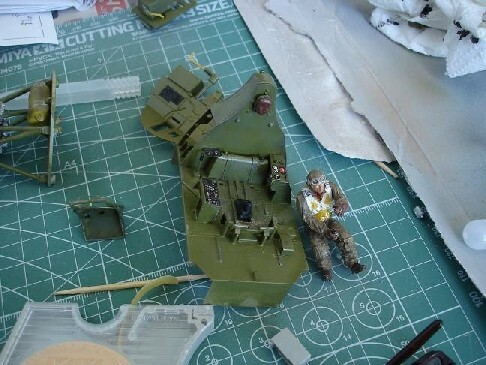 Someone mentioned the amount of interior green needed for the size of the Avenger and boy are they right, I only done a few of the different platforms and now I'm worried it's going to run out before I even get to the sides - not knowing how to mix my own I need to go back and see if the store has anymore of the same. Well enough writing and back to the work table .. If you give us some details I'm sure one of the experts can get you pointed in the right direction with your airbrush setup. What brush? Compressor? Do you have a regulator? What PSI are you using? Things like that can help us help you. My first airbrushing experiences were rather like using a garden hose! Better than a brush... but just barely. I still have trouble doing detailed work with it. and iv'e seen experts do things with paint brushes that i never thought were possible---sometimes we get bogged down in airbrushes------just my opinion. and please remember to enjoy the build and have some fun. 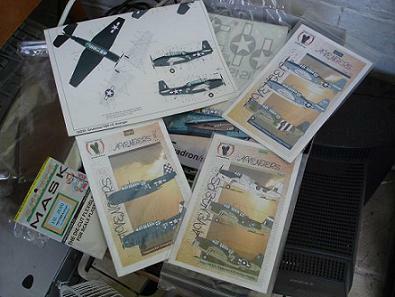 modelling is like every other hobby inasmuch as it's a learning curve---hell iv'e been doing it for 55years and you want to see some of my f... ups---and we can all admit to that! 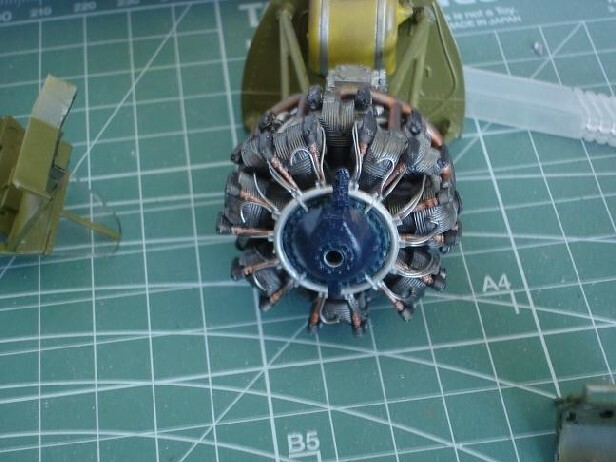 For airbrushing, every paint is different, but most of the time to airbrush acrylics it has been my experience that it needs to be thinned at least 50/50 or most of the time even 60/40 thinner/paint. Also, if you are getting spidering (paint wandering) or your paint is lacking in opacity, you are probably spraying with way to much pressure. I spray enamels at 15 - 18 psi, and acrylics at about 25 psi. If you spray too high, that can also affect how it covers and reacts. What kind of paints are you airbrushing? What do you thin with? If you could share that someone here could make some more specific recommendations. As to the cockpit and running out of paint, are you airbrushing or hand painting? I would airbrush everything you can as the paint goes on the subject at between 1/5th and 1/20th the thickness of brush-applied paint. Obviously this goes a lot farther. 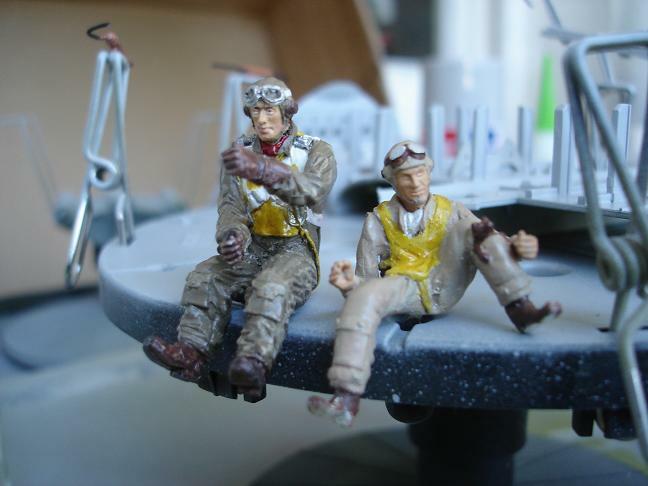 If you are airbrushing and not hand painting, again - if you are spraying at high PSI you can waste a lot of paint. Hope I have helped. Good luck. Well the airbrush is a Paasche Single action (H202 I think), don't have it close so I can't check and the paints are mostly tamiya acrylics (even if the one I used most so far for the interior is mrHobby) and yes Scott I got a nasty shock the first time I tried the brush - the compressor was set way too high and I had all the bent and shaped little PE's ready for paint and they flew all over the shop! Still finding bits from time to time, man some of those things are small - but I'll take you advice and will check what it's actually set to and maybe turn it down even lower. Guess it's a trial and error thing until you get it right. 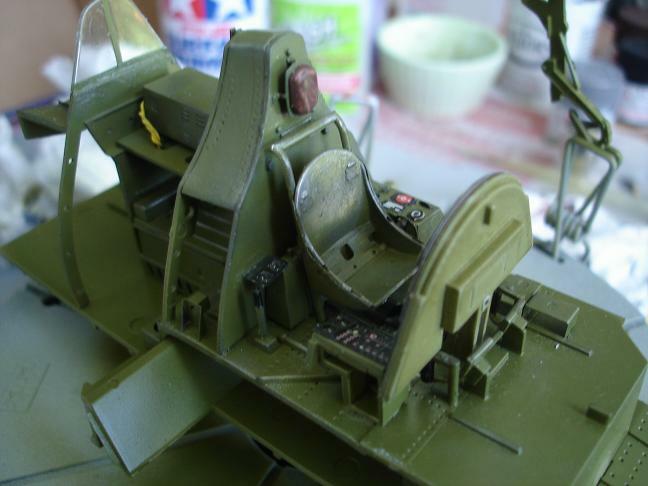 Yes I'm airbrushing the cockpit but I have had to redo some of the bigger areas more than once as I couldn't get the flow right, have ordered some more green (guess that's a colour you can't get enough of if you are doing most american planes) and got most of the internal stucture done now (still missing that camera) but the acrylics are still causing me some problems. With the varnish (only have had it on a spray bottle at the moment, and I have to hold it away like 50cm or it gets too rich) do you thinner that as well before using it? I have just got some vallejo matte but unsure if you thinner that as well or just brush it on as it is? I think you are on the right track. 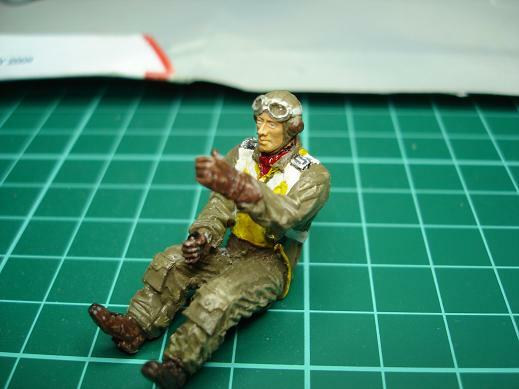 Try this - get some white photocopy paper or an old model and experiment with some old paint. Set your airbrush at 15 psi and spray on the paper, then increase to 20 psi and try it again. Thin your paint until it has the viscosity of skim milk or water. As you are spraying on the paper, if the paint moves around or "spiders" out in different directions, then your paint is too thin or your pressure is too high. If the paint is dry when it hits the paper, has a texture like sandpaper, or if it spatters or does not have a clean pattern, then the paint is not thin enough or your pressure may be too low. Take some notes and then you can really narrow it down in just a few minutes as to what mixture and PSI work best. I would say 50/50 or 60/40 thinner/paint and about 25 PSI for Tamiya acrylics works well in my Badger brushes. Mine are double action so experiment with yours - your mileage may vary. Not sure on the Gunze paints, I don't use them, but on most Tamiya paints, you need to start at 50/50 minimum to thin them enough. I would only use Tamiya thinner - or you can use 91% Isopropyl alchohol plus a wetting agent. A wetting agent is too keep the paint from drying too fast in the brush or in the air on the way to your model. If you cannot find acrylic wetting agent at your local hobby/craft store you can add a few drops of liquid hand or dish soap to your 91% alchohol. Just a few drops though, don't get crazy. Windex also works in a pinch. As to the clear coat/varnish - always thin everything and definitely airbrush. If you brush coat it you will get strokes - and it will look especially pronounced as the sheen will vary with the coverage of the medium. For acrylic-based varnish overcoats - I use about a 70/30 thinner/matte mixture, and a 60/40 thinner/gloss mixture. I spray at about 20 - 25 psi. For lacquer-based varnish clear coats, I use about a 70/30 thinner/medium mixture for both flat and gloss coats. I spray at about 18 - 20 psi. Again, try some out on a scrap model or on some paper scraps and take notes. Always remember - keep your brush clean at all times. Spray thinner/cleaner through it after every time you use it. Spray into a white rag or paper towel and ensure that all color is gone before you stop cleaning. If your airbrush has a removable needle, carefully remove it and wipe it gently with a rag and then replace it before you continue spraying. About every 10 times you use your airbrush then take it down and "deep" clean it as per your manual instructions... Good luck!!! Brilliant - Thanks Scott I'll try all of that out .. Here are a few pics of what I have done so far, only tried out the weathering tamiya kits a little so it's not ready and the base plate now on it's 4 repaint and this time it looks much better. Engine .. as it's not going to show so I only really done up the front. The spark cabling almost drove me to give up on the whole thing until I remember someone in a topic said that soldering was easier to work with than copper.